At this point we should now have a body all painted and a group of sub-assemblies all ready to make up into the final model. Usually the chassis parts are built up and the wheels put on. There is some debate about the need to have revolving wheels. It is a matter of personal choice but as we are making a model not a toy it generally makes sense to fix the wheels. Getting all four wheels on the ground is the most important thing. Generally cars don’t go, around with one wheel in the air! Any twist in the chassis should have been picked up earlier in the build but a minor difference may be corrected by revolving the wheels till they all touch or by doing a little filing of the axel pin to raise or lower a wheel, in which case you will almost certainly need to fix the wheels anyway. Next the engine goes in and the drive train completed with any detailing to the engine and chassis being done now. See our article on detailing. After the chassis is done the interior tub usually mounts to it. The glass of the windows usually fits into the body either as a single moulded part or as four separate parts for the front, back and side windows. Once in place the body and chassis are brought together and all that is left are the final external details. 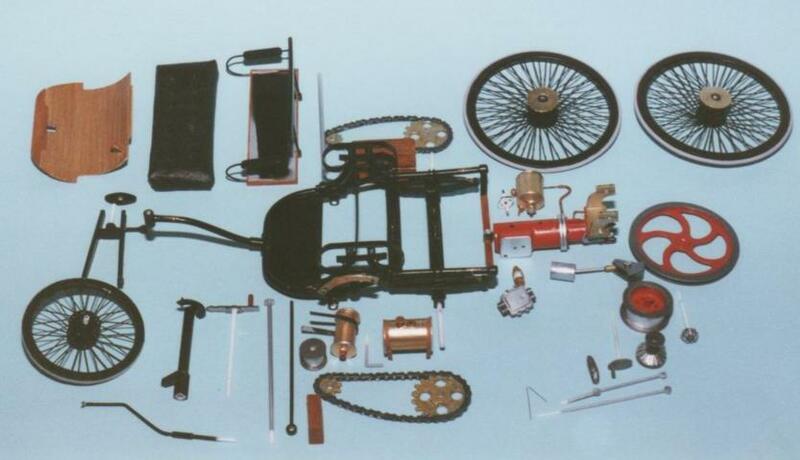 Above are two models at the final subassemby stage, a lotus 33 and the 1885 Benz prototype. Everything is painted and decaled and ready for the final assembling. Below is and example of a standard chassis, from a Lancia Stratos. It is waiting for the body to be finished and slotted on. The Stratos body is awaiting glazing and some more detail painting but all the other parts are attached and it can be fitted onto the chassis. Another Lancia, this time the Lamda, the chassis is of a different style but the principle is the same. the body slips down onte the chassis. Some cars will slot in from the front or the rear while others clip in at the sides. Grand Prix cars tend to build up a little differently, but generally you make up a floor pan-engine assembly and body assembly and put the two together. These lights have been attached with tiny drops of clear varnish, at this time 'protec' was the medium of choice but as it is no longer available most acrylic clear varnishes will do the job. Coloured lights of the indicators and rear lights need clear paints. Tamiyas range of clear paints has been used here but most major paint manufacturers now include a clear red, orange, blue and even green. The Tape on the Cortinas rear lights is household masking tape painted black and cut into strips. A recent addition to the modellers armoury is Gator grip, this glue can be thinned with water and dries clear so is good for the last tiny details. Where a more immediate ‘grab’ is needed super glue can be used. Apply by putting a blob in a tray or similar and take tiny dots of superglue with a tooth pick or cocktail stick. You must be precise with the positioning of the dot of glue and the part you put on it as you won’t get a second chance! Also superglue can leave a nasty bloom or fog on your paint work so avoid using it if you can. Clear acrylic varnish is the best option as it dries clear and contracts as it dries so leaves little evidence if you do use a little too much. The point is all these final details make the difference between an ordinary model and a really good model. So you need to take your time and do them right. Well, that’s pretty much all there is to it, the rest is experience from having a go. It may have been a bit longwinded for some or not be quite enough for others, so, If you want any more information or have any questions please don’t hesitate to e-mail us. RETURN TO Articles and projects page.